OK, I promised Part One would cover lessons from buses, but I think a short diversion is appropriate. Earlier this week, I was reflecting on an imagined London with cars as the unwelcome guests on our streets, and cycling and walking the ‘normal’ modes assumed to have priority. It’s worth doing this thought experiment every now and then, to highlight what our streets could be like and just how far away we are. For example, some authorities in the UK still have a ‘hierarchy of modes’, including my own local council. These tend to start with pedestrians and disabled travellers at the top (most important), followed by cyclists, followed by public transport users… with most car trips at the bottom. My local council’s better than most in the UK, but even here the streets look nothing like they would if we really put pedestrians, cyclists and disabled people first. On my street – pretty good in many respects, no footway car parking for one thing – pedestrians get one third of the space and cars two-thirds, with cyclists squeezed between parked and moving cars if both are present. Although only half the residents own cars, with very few driving to work, and there is little through motor traffic, cars can still dominate the street visually and physically. If I see kids cycling, they’re on the pavement. Although the car is so unsuited for mass urban transit – so unwieldy, so inefficient, so dangerous, so heavy – mass motorisation has powerfully marginalised other modes. The threats and inconvenience the car creates are why we bow to it. This example illustrates the persistence of what Professor John Urry has called the ‘system of automobility’, or, for brevity here, the ‘car system’. I’d tend to stress the human dimension more than Professor Urry does. A term well used on Twitter lately has been ‘contested space’. Even when there is no obvious struggle over space, it’s still there – it’s what makes up the car system. It’s the action of people – all of us, as engineers, designers, policy-makers, academics, planners, drivers, pedestrians, cyclists – often without any conscious thought at all. Sometimes it is explicitly sanctioned, sometimes not. 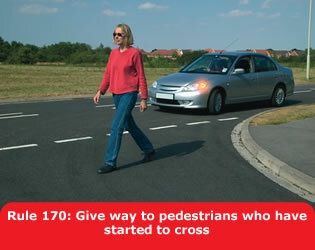 The Highway Code mandates pedestrian priority in this situation; yet contravention is expected and accepted. A personal experience of this last one brought the assumption of car priority home to me. Driven at and beeped at on the shopping street near my home, I had to jump out of the way, enraged and shouting ‘It’s my right of way!’ Which it was. I felt like the injured party, which I was. However, looking around, I wondered if through the eyes of others, I was a crazy lady getting in the way of cars, standing in the road and shouting. People averted their eyes as if I was about to run up to them yelling some nonsense about ‘Rule 170’. Much of the car system is taken for granted, just happens. Hence when travelling around the country, and seeing footways full of cars, I feel shocked because at least where I live, that’s been stopped and there’s an assumption that footways are for people, not parked cars. But most places it hasn’t. And where that happens, many people just expect to have to step into the road and walk around parked cars. People get used to the idea that protecting an inanimate piece of metal and glass is put ahead of their own safety. We learn from how the system works on an everyday basis, whatever the Highway Code says. As a sociologist, I find the car system fascinating and weird. There are many items that are what economists call ‘positional goods’ – a key benefit of the object is derived from having something that others don’t, something that is either physically or socially scarce. Fashion largely works on this basis. The opposite is the Internet. If I have the Internet, and virtually no one else does, it’s rubbish – the benefit of the Internet comes from everyone using – and often, contributing to – it. But if I buy a new and expensive pair of shoes, and see many other people wearing them, I’m not going to be happy. Part of what I’m paying for is the hope that you don’t have the shoes. But motor vehicles take positional goods to a new level. Having a new pair of shoes doesn’t entitle me to kick others off the street. Cars, on the other hand, marginalise non-users not just socially but also physically. This can be seen in the destruction of cycling in post-war Britain. I never tire of showing this graph in lectures and presentations; the first time I saw it myself I was shocked. I’d imagined cycling had gently declined – but no. As the level of driving exploded, cycling went from mainstream to marginal in only 12 years. At the same time, the risk of dying per km cycled tripled – an incredible statistic given that one would expect road death risks to generally decline; for one thing, health services get better at keeping people alive. 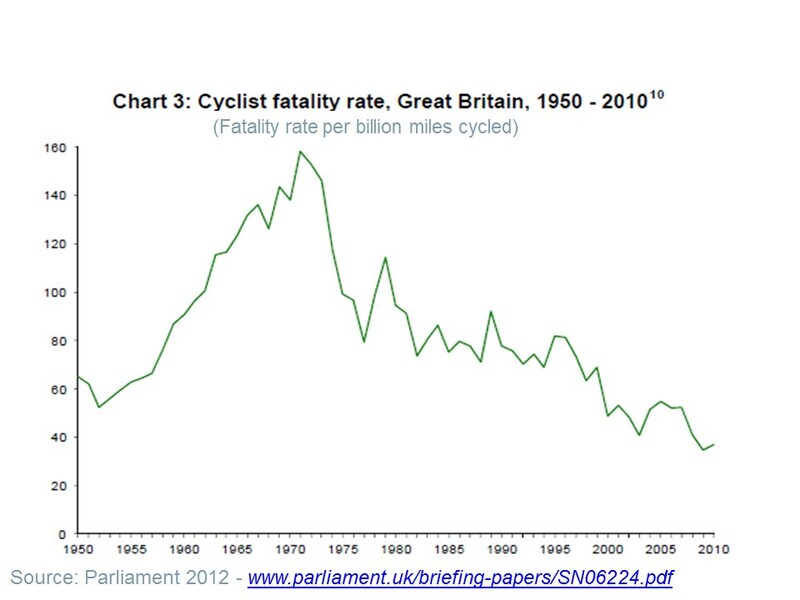 The risk of being killed while cycling is now only slightly lower than in 1952; a dramatic example of system failure (compare what happened to risks for car users). Cars scared people off the streets quickly, with a particular impact on cycling (in the UK, pedestrians usually at least had footways separated from the growing numbers of motor vehicles). Which is why my thought experiment feels sad. While we can easily imagine (and see every day, even where pedestrians apparently top the hierarchy of modes) children unable to cross the road because of cars, it’s harder to imagine (outside of Sunday play streets) cars unable to get through because of children in the road. Car priority is not of course only about violence. It’s about social pressure, the social obligation to move out of the way; this obligation’s ultimately backed by force but in most cases, violence doesn’t need to be used. Car priority is there in everyday experiences and behaviour, like close passing cyclists who are ‘in the way’, or beeping a pedestrian who looks like she might step into the road. ‘This is my space’ the action says, ‘you are out of place here’. And most people internalise it, whatever their mode choice; the car driver is not only in the road, but also in our heads, even if we never drive. This struggle goes on even in places that provide better for cycling and walking, as shown in a recent paper. But if somewhere aims to dramatically increase cycling levels, the struggle is particularly acute and becomes more visible – because it’s clear that change needs to happen, on the roads and in the way we – all of us – think. I’ve written about this elsewhere in terms of cycling equity. Our guidance, our images, our tools and our streetscapes embody the assumption that UK cyclists will be a tiny minority; young, fit, able-bodied, and male, travelling alone and quickly. (I admit to recently having said the words ‘it’s ok if you cycle at 15 mph’ to a disgruntled companion about a very ordinary rat run on my commute). Disabled people’s cycling, women’s cycling, children’s cycling, older people’s cycling is designed out – and our guidance then generally assumes that, for example, disabled people do not cycle, that cycling far from being an option for disabled people, is even a threat to disabled people. Car priority as a system feeds through into behaviour, into guidance, into policy, into (lack of) enforcement, into street design, into academic work. It’s ensured that, in Leeds and Bradford, £30 million on a ‘superhighway’ will mean cyclists give way to a side road, using a ten-year old design from London guidance now – thankfully – superseded. It’s meant that in London, high profile cycle ‘Quietways’ can involve granite paving substituting for protection and priority at junctions. Of course, there is some good stuff. Many good people working within (as well as outside) the transport planning system, doing things for cycling and walking that would not get done otherwise, often working long hours for little thanks. But it’s not enough. Systems, tools, rules, practices are the results of past actions, reinforced by present actions. We need to do more to change these systems, tools, rules, and practices, so they can better support people working within those systems who want to take the right decisions – and ultimately, ensure that whoever’s working within those systems takes the right decisions without even thinking about it. So that no one involved in planning – whether they are ‘committed’ pedestrians or cyclists, or not – would even consider making pedestrians wait three times to cross a road, making a major cycle flow give way to a subsidiary motor flow, or making cyclists ‘share the road’ with left turning HGVs at major junctions. We need priority for people over cars to increasingly become institutionalised. And it’s not easy, even when there’s the money and the political will, to make this shift. Having observed what’s happened in London and elsewhere over the past five years, I’ve started to think that creating a Cycle Priority Network could help. We have cycle networks across the country, but they mean little. They don’t provide protection from motor traffic where it’s needed, and where protection is provided, it’s often at the cost of priority and directness. They don’t follow the key desire lines. They don’t get priority gritting in winter (one interesting fact I’ve learned from some current research is that having to cycle over ice is more off-putting to women than to men – so gritting also has an equalities angle). They often get closed for extended periods when there’s roadworks, without any satisfactory diversion. They often include signs telling cyclists to dismount. We know all this. So how would a Cycle Priority Network help? A Cycle Priority Network could help unpick the assumption of automatic car priority, and start to introduce new ways of thinking, designing, and planning more consistently. Although car priority is widespread across our street network, we also have a Strategic Road Network, which brings together core routes for motoring, with its own design guide (the Design Manual for Roads and Bridges). In London (and in some other cities) we have a Bus Priority Network (of which more later), again with its own set of rules and prohibitions. For cycling, we have a mish-mash of schemes and brand names, with widely varying quality. Many supposedly key cycling routes, even in high-cycling areas, look as if cycling’s an afterthought; whereas strategic road routes are treated completely differently. A Cycle Priority Network would not need to be attached to specific design guidance in the first instance. But authorities across the country could be told to designate such a network, and funding could be made dependent on this. Of course cycling needs more money – £20 per head at least, if we are not to fall further behind high-cycling countries. But that money will be worth nothing if it turns into expensive give-way markings on pavements, or dotted lines on the road for that matter. Even on the best cycle routes that I currently know and use, there’s regular failings on all three counts. The terrifying spectre of delays to motor traffic is used as a reason to continue making cyclists using ‘official’ cycle routes cross busy roads without priority or protection, failing both (1) and (2). This needs to be unacceptable, just as it’s not acceptable to make traffic on a trunk road give way to a farm track – no one would ever consider designing or implementing it. It’s a question of priorities, and design flows from that. Otherwise, we risk throwing money away, and dissipating the momentum we’ve developed, thanks to the hard work of many people. Of course, there’s a risk that a Cycle Priority Network becomes a way to sideline cycling, to ensure it is seen as legitimate only on certain routes. We need to raise the standard of provision across the whole network. But right now, cycling is marginalised across that network, because of the underlying assumption of car priority; not only on a sub-section of the network, where it might be appropriate, but pretty much everywhere. Creating a Cycle Priority Network can start to provide a different vision, creating a real alternative to the car system, where demonstrably there are different ways of thinking, planning, and deciding. Your analysis of the decline in cycling is very good. Your propsed solution: to restore priority to cyclists is also good. In my view, this won’t come from the construction of “cycle infrastructure,” but from behavioural change. Most importantly, private cars need to be removed from the urban environment: they are dangerous, take up too much space, and pollute the air. Once this is done, there will be a nice cycle priority network called “the roads” to ride on. The Mayor of Paris is planning to reduce motor traffic by 40% by 2020, for example. And where does this demand “for all ages” to be able to use the roads come from? I’ve been seeing this a lot recently on cycling blogs. A child does not have the cognitive capacity to make complex multiple calculations of speed and distance necessary to use the roads until around the age of eleven or twelve. The Cycling Proficiency Test was traditionally passed in the last year of primary school (11 years old), the London Cycle Network is supposedly designed with “the sensible twelve year old” in mind. The French guidance is similar. I don’t see how the need to supervise children younger than this as they ride will change in any circumstance, though obviously riding on quieter, less polluted roads with calmer driving would be preferable for everybody. There isn’t a demand for children to be able to use “the roads”, (Douglas Carnall). There is a need for children to be free to travel on foot or by bike independently from at least the age of 8 without being at high risk of being killed or seriously injured. The countries that have solved this one have separate networks, or extra facilities at junctions to keep things safe. There are plenty of people who have no more cognitive capacity for judging speeds and safety than an eight year old. Those with poor eyesight or less mobility are also put at greater risk in Britain. And having been cycling with children on holiday in the Netherlands and for leisure trips in the UK, I can tell you that not having to supervise your child closely every inch of the way makes for a much more enjoyable experience for both parent and child. What a great article. I would try to add a few points of my own, but you are way more eloquent than me so I won’t, it would just make me look foolish. 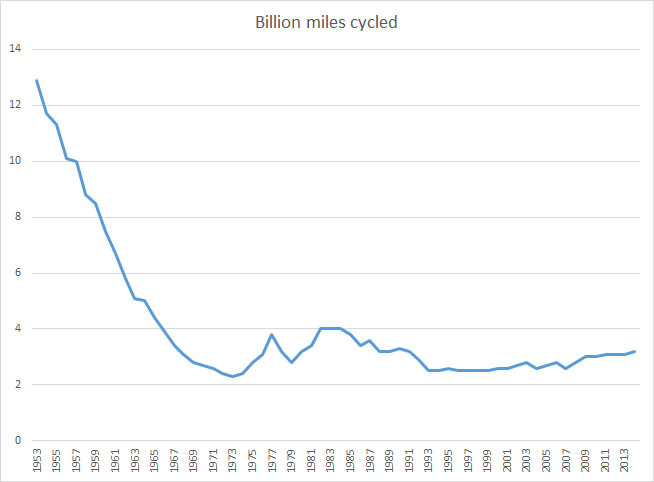 Very interesting (and very sad) graphs showing the decline in cycling miles covered over the years. By the way, Im a real petrol head and love motorcycles and (interesting) cars BUT not on our over crowded city streets every morning and evening rush hour ffs!! As an example of just how badly cyclists are served… just take a look at NCN41 between the center of Gloucester and the center of Cheltenham… and compare it to the road route. I particularly like the reference early on to internalisation of the dominant ideology of what I elsewhere call “car supremacism” – where you say, for example: ” People get used to the idea that protecting an inanimate piece of metal and glass is put ahead of their own safety. We learn from how the system works on an everyday basis, whatever the Highway Code says”. Not that incredible. The effects of superior trauma care are either seen over long periods of time ( between the 1930s and now, for example) or with regard to specific types of intervention, possibly some have occurred during this century but none during the 1960s period you refer to. What DID happen then was that the explosion of motorisation led to a brief but significant increase in various kinds of casualty, associated with the sudden increase in motorisation and the fact that people take some time to adapt to a change in kinds of danger – in this case the big increase in (new) drivers on the roads. Along with the very significant increase in the numbers of drivers capable of hitting cyclists, the decline in cycling numbers reduced the SiN (Safety in Numbers) effect for cyclists, so with these two factors you can understand the massive increase in cycling casualty rates. @Douglas – behavioural change? You mean like what the UK has been trying since the 30’s? I want to see mass cycling in my life time, thank you very much. I don’t want to wait for human nature to finally change from the greedy self-centrered power hungry individuals we all are to a utopian lover of all. That will take a few hundred years, at least. Until then we need segregation from motor traffic, among other things.